This paleo pecan-crusted salmon is an easy way to transform salmon into something extra delicious! It’s also Whole30-friendly. Scrolling through my Facebook feed, I see that a ton of people are doing the Whole30 diet. 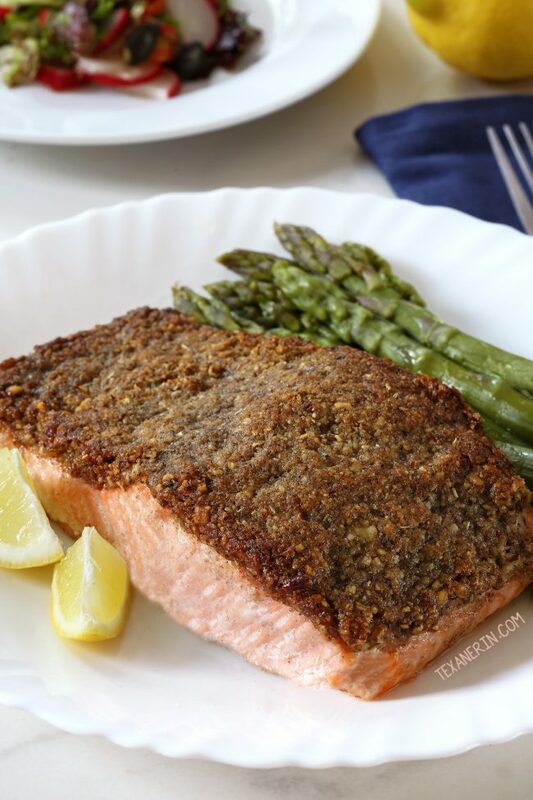 So it seemed like the right time to share this pecan-crusted salmon recipe! If you’re looking for what to serve with it, this vegetable slow cooker quinoa with golden milk from Food Faith Fitness would be great! This is by far my favorite fish recipe and my go-to dish for when we have company. I have no idea if the topping would work on poultry or other types of meat because I haven’t tried it but I don’t see why it wouldn’t. I would happily eat salmon every day if I could. Along with these crispy baked sweet potato fries from Foodie With Family. Ever struggled with soggy fries? That post has loads of awesome tips which pretty much guarantee crispy fries! But there’s a downside to salmon – at least the affordable farmed kind. Did you know that farmed salmon would be gray if they weren’t given supplements that redden their flesh? I think that’s nasty. And that’s just one of the problems with farmed salmon. You can read more about that here. Unfortunately, fresh wild salmon is way beyond affordable where I live, so I always buy wild frozen salmon (except for when I made it to take these pictures!). The frozen filets are quite dinky and just not nearly as delicious as the fresh kind. They don’t even taste like salmon! But when you add this pecan topping, it makes those sad little filets just as delicious as with fresh fish. :) If you don’t like pecans, it works just as well with walnuts. I added a little more flavor with some paprika and herbes de provence that makes this pecan-crusted salmon even more delicious. Rachel Cooks has a homemade herbes de provence recipe that sounds great! By the way, have you ever looked up the serving size of salmon? So confusing! I see some sources saying that 3-ounces is a serving, while others say 6-8 ounces is more typical. I put down 3 servings for the pound of salmon called for in this recipe but you’ll have to eyeball it and decide what’s a good amount for your family. Preheat the oven to 350 °F (175 °C). Get out a casserole dish large enough for the salmon. Place the pecans in the casserole dish and toast the pecans for 3 minutes, mix, and toast for another 3-5 minutes or until the pecans smell toasty. Remove from the oven and turn the heat up to 400 °F (205 °C). While the pecans are cooling, place the salt, pepper, herbs de Provence, smoked paprika and coconut oil in a high-powered blender or a food processor. Once the pecans have cooled, add them and then pulse a few seconds or until the pecans are nicely ground. If using a high-powered blender, be very, very careful that you don't overprocess them! It's easy to do. Grease the casserole dish and place the salmon fillets in there. Divide the pecan mixture in half and pat evenly over the top of each fillet. Bake for 14-20 minutes or until the topping has lightly browned and the fish flakes with a fork. Serve immediately with fresh lemon slices, if desired. 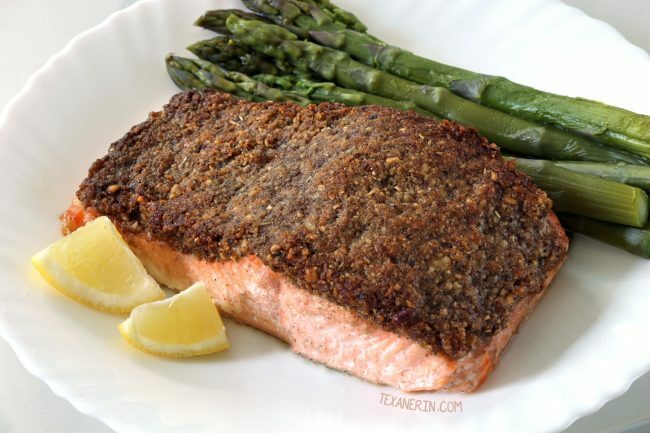 39 comments on “Easy Paleo Pecan-crusted Salmon (Whole 30)” — Add one! You’re welcome! I’m so glad you liked it. :) Thanks for your comment! This is so good! This is my new go-to salmon recipe. The way the pecans trap the moisture in the salmon is just perfect. Thank you for sharing this! You’re welcome! I’m so glad you liked it. :) We have it once a week here! So much better than plain salmon. Thanks for your feedback! Excellent recipe. My whole family enjoyed it! 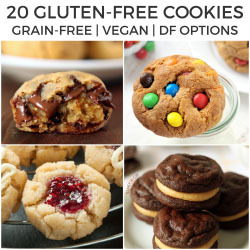 My family and I really love this recipe! I have one question though, do you melt the coconut oil before you mix it in with the seasonings? Or is it not necessary? (I’ve been melting it because I figured that was safer! ;) Another thought, is that maybe the warm pecans melt it? Hi there! So happy that you all enjoy it. :) There’s no need to melt it at all. If it’s winter and your coconut oil is firm, that works. If it’s summer and it’s already melted, that works, too. Thanks for your comment! Wow — this is delicious! I used olive oil in place of coconut and it’s came out great. One of the people I made this for didn’t like it because of the spices (I used Italian seasoning) but I thought it was great. I think this will become my go-to salmon recipe! I’m happy to hear that it’ll become your go-to salmon recipe! That’s awesome. :) Italian seasoning sounds yummy! I’ll have to try that, too. Thanks for your comment. This was absolutely delicious. I’m on the Whole 30 diet and this was just what I was looking for. My husband loved it too. My only question was how to crisp up the pecan “crust”. It was moist. Maybe I used too much coconut oil when I made it. It was still heavenly however. I’m happy that you enjoyed it! I wouldn’t say that the crust is really crisp, but shouldn’t be moist, either. It’s not going to get crunchy like a breaded kind of crust. You could indeed use less coconut oil next time or put it under the broiler briefly. That should make it less moist, at least. :) Thanks for your comment! I made this for dinner tonight with my girlfriends and it was a huge success! Thank you for the awesome recipe – so nice to serve a delicious Whole30 compliant meal that I can have and my friends who aren’t on the plan still love! I love it when people not following my diet can enjoy the things I can eat, too! I’m happy it was a hit. :) Thanks for your comment! I couldn’t find pecans at our grocery store. What other but would you recommend substituting? We didn’t have walnuts either. Sigh. Walnuts are the only other ones I’ve tried. I think almonds are too firm and cashews would just taste weird. Sorry about that! Will this work with salmon filets that have the skin on them? This is hands down the best salmon I have EVER made! I had a large piece of salmon and ended up doubling the crust, which was completely unnecessary. I making this again tonight with the same size salmon as I used last time but will keep the crust recipe the same. Thank you, thank you, THANK YOU for this recipe! It is delicious!!! Thank you for the recipe!! Yay! So happy that you like it. 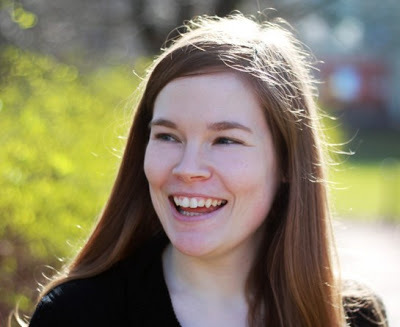 :) Thanks for your feedback! So this is a stupid question, but does one cut off the skin that comes on a fresh piece of salmon? Or do you put this crust on top of the grey part? Not a stupid question at all! Put the skin side down on the pan and then the crust over the pink side. Or does your salmon come with skin on both sides? If so, follow the directions here to remove the skin on one side. :) I hope you’ll enjoy it! I’d love to hear how it comes out. I’m not doing the whole 30 all the way but I am on the hunt for new whole 30 recipes to add into my diet. This one is totally happening soon! I love crusting my fish in pecans! That crust sounds delicious! Loving this salmon recipe! This is the prettiest salmon I’ve seen. I love the pecan crust, such a great way to get the crunch without the carbs. This sounds amazing! Your pictures make it look like perfection! I just never acquired a taste for seafood. A tiny bite of seafood with a big bite of hushpuppy, or slaw is my only way of eating it. HAHA!! It is the only thing I eat catsup on too. Not even a hotdog or hamburger. Hope you all have a Happy, Healthy, Prosperous 2017. Such a perfect-looking piece of salmon and I love the sound of that crust! Being from the PNW, salmon is a big part of our diet. And luckily it’s not too crazy expensive. I love this!